We love anything and everything Audemars Piguet. If you are thinking of selling one of these fine watches give us a call or fill out the form on the right for more information and to set up an appointment. 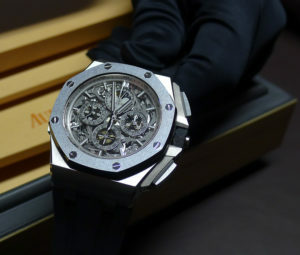 We can help you sell your Audemars Piguet watch in the NYC area for top dollar! First and foremost here is some information about the brand. Audemars Piguet was started by two aspiring Swiss entrepreneurs, Jules- Edward Piguet and Louis Audemars. The idea was designed by the 2 in 1874, but did not turn into a company until 1875. The business was formerly named Audemars Piguet et Cie, but the two young men decided that dividing their organization in half will be best. While Piguet was in control of revenue, Audemars was in control of the technological facet of the business enterprise. The organization turned the largest manager of watch making in Vaud. This ultimately gave constant cash flow, which permitted their first individual division to open in Geneva in 1889 to the business. Like every up-and- enterprise that was returning, issues occurred, and Piguet died. At that time, Audemars Piguet secured commitment buyers including Cartier & Co., Tiffany, and Bulgaria. These firms resell them through their particular retail locations and would buy Audemars Piguet watches in volume. Between now as well as the depression, Audemars Piguet developed multiple industry-changing watches including the smallest moment repeater watch along with the worlds thinnest pocket watch. We buy all models including but not limited to the Royal Oak, Royal Oak Offshore, Millenary, Jules Audemars, Tradition, Classique, Ladies, Novelties and many others. We are located in midtown Manhattan in NYC’s Diamond District and strive to be the best and highest paying Audemars Piguet Watch Buyer in all of New York. We are located at 30 West 47th St #806 New York, NY 10036 and we are open from 10am-6pm from Monday to Saturday and are closed on Sunday. Feel free to stop by during business hours or give us a call to make an appointment, remember bring everything that came with your watch for the best price guaranteed.